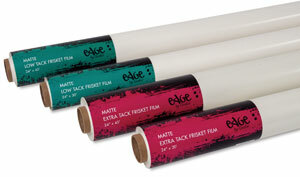 Because it comes in rolls, Grafix Edge Frisket Film is great for large projects like murals. Grafix Edge Low Tack is ideal for masking off freshly painted areas or sensitive surfaces. Grafix Edge Extra Tack is especially helpful when you're working on rough or porous surfaces like brick or wood. Grafix Edge Low Tack Frisket Film is ideal for masking off freshly painted areas or sensitive surfaces like paper. It's also an excellent masking material for porous surfaces like plastic or glass.